Euthanasia Prevention Coalition Euthanasia Prevention Coalition: South Africa Supreme Court rejects euthanasia. South Africa Supreme Court rejects euthanasia. The Supreme Court of South Africa rejected euthanasia and assisted suicide by overturning the lower court decision that approved death of Robin Stransham-Ford, of Cape Town, by euthanasia or assisted suicide by Judge Hans Fabricius on April 30, 2015. "The applicant is entitled to be assisted by a medical practitioner either by the administration of a lethal agent or by providing the applicant with the necessary lethal agent to administer himself." Stransham-Ford died of cancer two hours before the order was granted. BREAKING NEWS: Today, 6 December 2016 the South African Supreme Court of Appeal said that Judge Fabricius was wrong in his 2015 judgement authorising Robert Stransham-Ford to have assisted sucide/euthanasia. The separation of powers requires that parliament as representatives of the country as a whole should decide any changes on the law rather than requiring judges to decide. The applicant died before the ruling was given. Circumstantial evidence seems to indicate this information may have been deliberately withheld from the court. Judge Fabricius ruling was decided in haste (one day) on a matter of national importance, an urgency apparently manufactured on an individual case by the lobby group Dignity SA. The applicants attorneys had refused to provide the opposing friend of the court legal teams with information they needed to respond. The South African situation is different to the juristictions where euthanasia is legal, which argues against foreign cases being used as precedent. We have different social values, a different socio-economic and policing situation. The applicants affidavit was factually and medically doubtful on many points. The organisation Dignity SA was publicly raising funds to pay for the court case, but the application insisted it was just on behalf of the individual. The hasty Fabricius judgment did not properly consider South African law or international precedent cases. Judge Fabricus was wrong to assume that the common law on murder needed to change to accommodate assisted suicide and euthanasia. The court needs to consider whether its decision would undermine the foundational value of the right to life or be supportive of it. The picture of Mr Stransham-Ford's final illness as depicted in the legal affidavits bore little resemblence to reality as found in his medical records. The psychologist who declared the applicant Robert Stransham-Ford to be psychologically fit and his desire to apply for suicide, did not provide reasoning on how the conclusion was reached and previously lived in the same street as him, which raises questions of independence. The Centre for Applied Legal Studies, at Wits submitted argument to the court that euthanasia and assisted suicide were working well overseas. The Health Professions Council of the State and the State submitted detailed evidence rebutting these claims and giving evidence of numerous abuses and problems overseas. The court provisionally accepted this evidence but after reviewing it, decided that it was too complex and detailed to sift through or decide on. 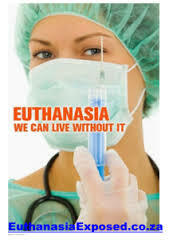 Euthanasia Exposed (SA) formed to oppose euthanasia and assisted suicide in South Africa, prepared an excellent opposition to the Fabricius decision that is published on their website. Viktor Frankl: Finding meaning in suffering. Italian doctor and nurse may have killed dozens.